This chapter discusses the interrelationships between the three main variables that may provide extra insights into the ways and purposes for which thinking styles might be addressed in computational modeling. Successful modeling of inference patterns often addresses these three primary variables: (1) the inferencing styles for each of the three stages (Discerning, Goal-Setting, and Problem-Solving), (2) delineation of each of the three functions according to the components of each, and (3) generic contextual analyses. Although inferencing styles (1) can be run independently of delineation of function and contextual analyses (2 and 3), they cannot have applicable meaning without knowing to which stage they apply (2). Although the styles and function analyses (1 and 2) can be run separately from contextual analyses (3), the algorithms and the stages to which they apply cannot be meaningfully modeled without generic contextual analyses. Other variables (such as temperament, skills, intelligence, and so on.) may be required, depending upon the purpose of a particular application. 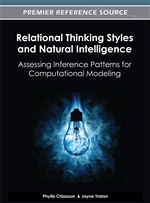 The purpose of this chapter is to suggest additional variables that might be useful to consider for computationally modeling and perhaps improve the usefulness of Relational Thinking Styles (RTS) and its analog model, the Davis Non-Verbal Assessment (DNV). Philosopher Charles Sanders Peirce once explained that an occurrence is “a slice of the Universe [that] can never be known or even imagined in all its infinite detail” and that every fact within every occurrence is “inseparably combined with an infinite swarm of circumstances, which make no part of the fact itself” (Rosenthal, 1994, pp. 5-6). In other words, we can never know everything about anything, nor do we need to. On the other hand, Peirce points out that a fact, which can be extracted from this swarm of circumstances by means of thought, is only so much of reality as can be represented by a proposition (Rosenthal, 1994, p. 5). One aspect of preparing a proposition for testing is determining which factors within the swarm of circumstances matter and which do not. How this identification of new possibilities, relevant facts and the prediction of consequences from testing propositions ought to be done is one of the lines of inquiry in the field of computational philosophy. Computational philosophy concerns the identification and study of philosophical and scientific constructs that are in some way quantifiable and can thus be modeled by computers. For example, game theories are philosophical constructs and many actual computer games (such as Civilization and The Sims) are the result of computational models of philosophical constructs. Paul Thagard writes that computational philosophy of science is “intimately tied with cognitive psychology and artificial intelligence” (Thagard, 1993, p. 7). Members of the Computational Philosophy Lab in Pavia, Italy (http://www-3.unipv.it/webphilos_lab/cpl/) are exploring many areas within this field1, including some of the ones that RTS focuses upon: the modeling of practical thinking habits, abduction, creative reasoning, and model-based reasoning. RTS also places great importance upon physical and conceptual umwelts or affordances (the environment as experienced by a particular individual), such as those described by Jesper Hoffmeyer and in his 1996 book, Signs of Meaning in the Universe. As we explore computational applications for RTS, it is also important to consider what other facts (variables) besides inferencing patterns we can know about someone and how these combine with inferencing habits to enable more accurate performance predictions. For, although RTS provides vital information about how someone will perform over time, it is not a stand-alone factor for predicting success. In fact, RTS on its own cannot predict who will be certain to meet with long-term success in a given position, though it provides guidance as to who will tend to fail. With the addition of variables into the modeling of inferencing patterns, it becomes possible to make ever better performance predictions. This chapter addresses the three most important sets of variables—inferencing patterns, contexts of inferencing, and individual temperaments—that ought to be included in any computational model of RTS, and to suggest ways in which the latter two variables might be assessed. Although the importance of other variables will rise or diminish depending upon the requirements of a given situation, inferencing styles, context, and often temperament, provide information for predicting consequences of thinking style patterns.